I'm sure by now, by my abundance of posts about Iceland, you can tell that I have fallen in love! The people are warm and welcoming, the country is absolutely beautiful, and it's so close. I cannot wait to return, and I have a perfect reason...to see the Aurora Borealis. The Aurora Borealis, also known as the Northern Lights, is created when particles are electrically charged by the sun. 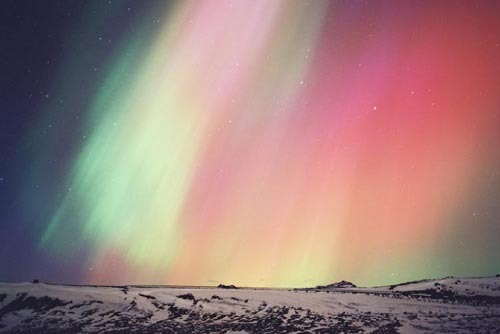 Supposedly, you can see the Northern Lights on cold, crisp nights between September and April. We thought that a trip in November would have been the perfect time to see the Aurora Borealis, but unfortunately, we did not see it. We got conflicting information while we were there about the odds of seeing it. Bottom line is, Auroras are difficult to predict with precision- it's Mother Nature's call. So if you go out to see them you need to be patient and hope that you get lucky. You can't know if you'll see the lights until the last minute. We talked to locals while we were there and many said mid-January through mid-March is a better time of year to see them. The air is so cold and crisp during that time, that many Icelanders say you can even see the lights while walking around downtown Reykjavik. I just looked into flight & hotel deals for February, and I see prices starting in the low $400's per person. I'm going to keep my eye on it, because it's very easy to jet set there on a Thursday night and come back on a Sunday...I'll let you know what happens.